101116 - Up and saw the boys off to school. On the phone for a 4 hour meeting... Worked the rest of the day then dinner. Jeff stopped by to show me his new ride. 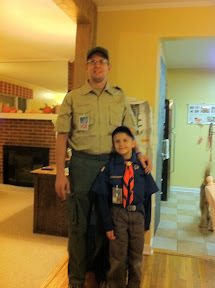 Then J&I got all dressed up and headed to our first 'official' scout meeting. But it went well. Home, got J showered and to bed. Up late getting ready for tomorrow.